Jinxed Philadelphia is pleased to announce: GIVEAWAY promo for the latest and greatest at The Mütter!! 💀💀💀The Mütter Museum has a legacy of eye-popping oddities, and in honor of the 150th anniversary of "Alice In Wonderland" will be screening the Jan Svankmajer's Alice (1988), a unique adaption created with a mix of live action and stop motion animation. 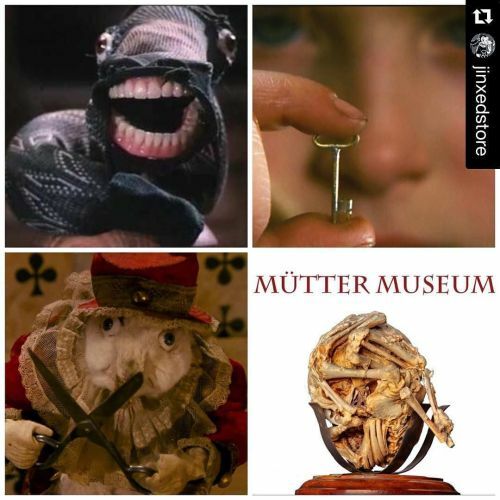 🙀 The Museum will ALSO be hosting a stop motion workshop where you can make a film of your own (proudly furnished with a variety of Jinxed oddities and items to make your movie) SO HERE'S THE GIVEAWAY👀 : repost this image in your feed, tag us AND The Mütter, and you'll be entered for a chance to win a pair of tickets to the screening and the stop motion workshop Saturday March 12th!! We will select the winner at random this Sunday March 6th so repost to win and check out bit.ly/mutteralice for information and tickets (while they last!)" By muttermuseum on Instagram.